Pennsylvania's mandatory seat belt law isn't just about keeping you safe — it's about everyone in your vehicle. Studies have shown that in a 30 mph crash, an unrestrained adult is thrown with a force of 3 ½ tons — or about the weight of an elephant. Can you imagine if you were that elephant hitting a loved one in your vehicle? I'M NOT DRIVING VERY FAR. FACT: Three out of four crashes occur within 25 miles of home. I'M RIDING IN THE BACK SEAT. FACT: You can still be thrown from a vehicle even if you are riding in the back seat. If you are unrestrained, you also pose a risk to others in the vehicle with you. I DON'T WANT TO BE TRAPPED BY A SEAT BELT IN CASE MY VEHICLE CATCHES FIRE OR IS SUBMERGED IN WATER. FACT: Less than one-half of one percent of all injury crashes involves fire or submersion. Also, national research has shown you are 25 times more likely to be killed if you are ejected from the vehicle. I'M DRIVING AT NIGHT AND THE POLICE WON'T SEE ME. FACT: Police departments are increasing nighttime enforcement. In addition, there are more high-risk drivers on the roads at night, such as impaired drivers and drowsy drivers, which may present increased risk for a crash. I'M PREGNANT AND THE SEAT BELT IS TOO TIGHT. FACT: Wearing your seat belt is the best defense for you and your baby in the event of a crash. Adjust the lap belt so that it fits snugly over the hips and pelvis, below your belly. 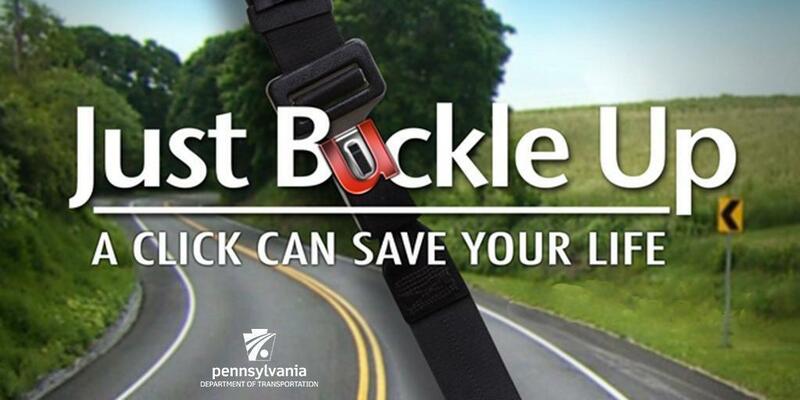 Pennsylvania's seat belt law requires drivers and passengers 18 years and older wear a seat belt when behind the wheel or in the front passenger seat. If you are a driver 18 or older and police pull you over for another violation, you'll receive a second ticket if you or your front-seat passengers aren't wearing seat belts. Children ages 4-8 must be restrained in an appropriate booster seat.